Mandore is situated five miles from Jodhpur. It was the former capital of Maharajas of Marwar who later moved to Mehrangarh Fort for better security. Sightseeing includes the now ruined Mandore Fort, and the cenotaphs of the erstwhile rulers. Here the cenotaphs are different in that they are not shaped like the chattris found more frequently but are like a Hindu temple. The most impressive among these is the Cenotaph of Maharaja Ajit Singh who was the ruler from 1678 to1724. Each cenotaph is set in a beautifully landscaped garden, hence 'Mandore Gardens'. The cenotaphs of Maharanis are set over on a rocky hill and these are also set amidst lush gardens. The Hall of Heroes has statutes of deities and Rajput heroes carved out of rock and painted in brilliant colours. Also visit The Shrine of the Three Hundred Million Gods that has images of various Hindu gods. 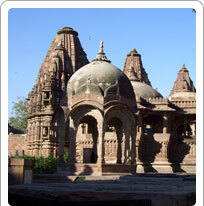 Mandore is quite popular with the tourists for its greenery and ancient ruins.